WINTERLAND: THE QUEST FOR CHRISTMAS, the Northwest Church’s Christmas musical for 2007, closed Sunday afternoon after five performances. Each performance was very full, and audiences seemed to enjoy the experience. 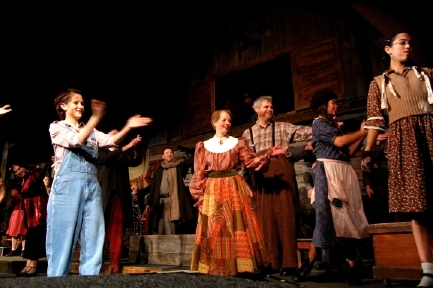 Most were surprised at the size of the show: a two-hour, 32-cast-member folk musical featuring 18 new songs, about half of them featuring the full chorus. In the end, the performers sang their hearts out and worked harder than any musical cast I’ve had the pleasure of working with. It was a real joy to see these performers stretch and grow throughout the process, and our audiences seemed to really appreciate their work. There were the usual mishaps…missed lines, forgotten entrances, and the occasional missed notes, but most people never noticed. Most of my friends who came to see the show had a single observation: it was a monster show. One person said it made them tired just looking at it. I’ve been calling it my little Christmas musical, but as those who experienced it know, there was nothing little about it. All I can say is that the process yielded a story and a journey that might not have been exactly right artistically, not exactly what I intended (as I said in my director/pastor notes), but one that leaves me with great satisfaction and joy for this particular moment in the development of this story idea. My hat is off to the production team and the cast. Absolutely amazing attitudes among the people who do this for the sheer love of it, as well as for the great opportunity of inviting people from the community into the life of the church, and hopefully, into the life with God. How God works in these things is His to know, and I am happy to leave it in His hands, knowing that good will come. Enjoy a few more pictures over at the photo blog. Being a part of Winterland was a gift that caught me by surprise. I may have sat quietly through a lot of the rehearsals leading up to the musical, but I was always taking it all in. God has a funny way of tilting the table when least expected, sending a person rolling in a direction one didn’t think possible. Yet, He always knows best. The Lord taught me more through Winterland than you’ll ever know. Thank you for letting God use you to be a gift to all of us who were a part of it.